For all the noise about Darwin's descent with modification, a deep understanding of evolution provides a delightful way to hold together just about everything we know in biology without referring to supernatural concepts. You don't need to "believe in it"--there's no leap of faith needed--it works well, and unless some as yet fantastic empirical data gets revealed, it's not going to need major tweaking. Meanwhile, kids get drilled on the Big Bang Theory with little complaint in these parts, a model which purports to explain the origins of our universe (or at least everything since after the first 30 seconds, when the universe got to be a few millimeters in diameter, which, of course, makes no sense without a reference). Look in a textbook and read about it--about 14 billion years ago or so (give or take a billion here or there), the universe was a singularity, a point. Something happened--and space started to expand, to exist. The big bang theory says that 12 to 15 billion years ago, an event called the big bang sent matter in all directions. This matter eventually formed the galaxies and planets. Big problem--there was no outside, there were no directions-- at least according to the model. So who is looking at the "explosion"? God? The model too often gets oversimplified, taught by folks with insufficient understanding (and I put myself in that category), and as a result we create myths instead of a scientific model. When viewed this way, the Big Bang model becomes a religious one. Yes, I know the picture is just to help students imagine the event, and yes, I know that the textbooks are not pushing the God thing, but the result is the same. It's bad science. What do I do? I hedge. If we accept that the universe is expanding (and we do little in class to show this is so), then it makes sense to think that the universe was "smaller" or "more dense" in the past. And that's as far as I can take it with "low level" freshmen, without getting into religious (by my understanding) grounds. My kids may leave 9th grade knowing a little less about the common scientific myths we thrust on 14 year old children in our schools, but I think they might have a better grasp on what science means. I am a science teacher--I teach science. The artwork is from NASA. I never really considered the big bang as a physics corollary of the evolution debate. I'm not sure if I'd use this in my classroom but at my house, we say that there's no contradiction - perhaps when God said "Let there be light", the result was much more excitement than expected. I've enjoyed your posts on evolution and the big bang theory. Your students benefit greatly from your approach. I'm off to "believe" in the theory of gravity by tipping a few cold ones slightly higher than my mouth. Enjoy the start of the school year! 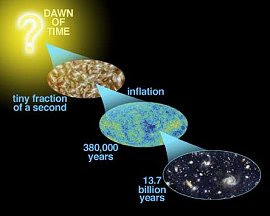 I don't think that the big bang model is a physics corollary to Darwin's descent with modification as much as I think that it is a religious concept, at least as presented in freshman science class. I suspect that one reason it is not as vigorously attacked as evolution is because it complements Genesis well. Evolution lies outside of religion, does not require a supernatural being, and as such is truly a threat to folks who take the Bible literally. I may go back and edit the post since you got me thinking about that--the big bang is not as controversial because the simplified version does not contradict the dominant religious view here in the States. First, I must commend your empirical approach to the law of gravitation, and I daresay an August afternoon is as good a time as any to employ your methods. I will add this--I believe in the Law of Gravity. There is no way to prove its universality nor its timelessness, but I accept that--and that's what makes it a belief. I know you know this already, but it's a critical part of grasping science--what is it that we believe (such as the laws, which are behaviors of the universe accepted as universal and timeless--that is, trusting that the universe has an order to it) and theories, which are constructs and as such may be modified. As flattered as I am--and I am easily flattered--I usually drop these comments from the blog. I'm not sure being a top "educationy" blog is the kind of exposure I need. @ doyle - good points all. It's an interesting discussion. Thanks! I think your word "gravitas" (or rather, the early Greek's word) is the answer. We human minds gravitate (no pun intended) to finality. We want the ultimate answer to everything. Worse, we believe there is an ultimate answer to any question we develop. Getting the answer key is easier than having to think. You teachers all know that. Gravitas, in the minds of many modern westerners, is the ability to provide ultimate answers. What a huge mistake, and what an abdication of responsibility to think. And yet our digital tv frequencies are full of idiots willing to provide ultimate answers to everything, and the public is willing to accept because it's not enough to be a couch potato - one must also be a comatose couch potato. God forbid we actually think. As you have pointed out indirectly, any serious physicist will tell you that the "big bang" is a metaphor for - "we have this time line problem and because it's 'time', for God's sake, it must have a beginning and an end," when the ultimate answer is that is there is no knowing of the origin of the universe, only speculation of what happens in the limit as time approaches zero. Similarly, what is the answer to 1/0? One divided by zero is not infinity, as we know. The limit of the function 1/x as x approaches zero does blow up infinitely, but 1/0 is not infinity. Irrespective of the fact we can write and see the equation 1/0 with our own eyeballs - it simply doesn't exist. Our simple math doesn't work if it exists. It's illegal. What happens at the singularity in the "center" of a "black hole"? While it's a real question, it's not relevant. Life, math, physics as we know it doesn't exist there. We can pose the question so it must have an answer - an ultimate answer- but it is oh so unsatisfactory to hear a physicist say - it is undefined. And it's not like the source of the info matters, because even Einstein told us he hated the whole idea of a singularity where reality broke down - but even he had to live with it. So we don't even believe Einstein. We have a really hard time with these questions of no answer, and in teaching young people, it must seem like an erosion of authority to some people who have to say - "We simply have no answer to that," or worse, "We can have no answer to that in the current framework of our knowledge." That's when people start invoking the trump card. It must be God. He knows. Let's get God to answer it. How unsatisfying it must be when some of us say/believe - "I think he already has..."
As usual, dead on. I am tempted to take your comments and post them. Gravitas, in the minds of many modern westerners, is the ability to provide ultimate answers. What a huge mistake, and what an abdication of responsibility to think. This is the crux. While pockets of thinking happen in schools, far too often we reward students for mindlessness.